"For us, the Lighthouse Foundation is an amazing organisation with which to partner, and we look forward to helping them with their incredible work." Oscar Hunt Tailors are proud to partner with the Lighthouse Foundation with the exceptional assistance of Purposeful. Purposeful help businesses form stronger, more collaborative relationships with community organisations to solve some of society's most difficult social problems. With our showroom on Hardware Lane in the city we see homelessness first hand, and being part of the Melbourne community we feel it right that we lend a hand. For us, the Lighthouse Foundation is an amazing organisation with which to partner, and we look forward to helping them with their incredible work. Wednesday 14 June 2017 is Lighthouse Foundation’s inaugural 4Up Day – a unique day where all donations will be matched FOUR times for 24 hours to help end youth homelessness. 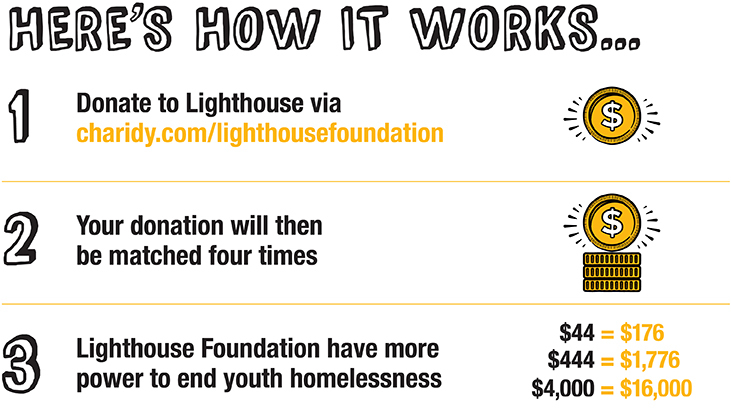 The goal is to raise $576,000 to bring twenty new young people into the safety of a Lighthouse home and break the cycle of homelessness.